Hi, I am interested in your 1987 Buick Regal (stock #1709-TPA) listed on Autotrader for $28,995. I'd like to get more information about this vehicle and confirm its availability. 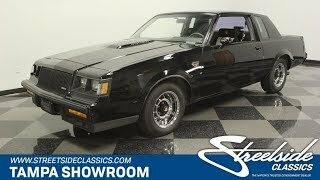 With the value of the turbo Buicks skyrocketing lately, a car like this 1987 Buick Grand National thats so compete, loaded, and offered at an obtainable price is the stealthy black machine that you know is also a red-hot commodity. You already know the legend. General Motors had a short run of Buick coupes that looked mean and had the performance to back it all up. Its Regal siblings have a great creased appearance that instantly conveys a feeling of premium. But where they liked to use chrome to make a statement, this one reserves the brightwork only for the polished wheels. That sends a very different message. The blacked-out trim, the bulging hood, and the subtle ducktail spoiler all give this car a look that demands respect. And its all set against black paint to give this the kind of evil look thats pure fun. Thats why these are one of the most coveted coupes of the new classic era. The correct black and gray bucket seats up front look great, and yours even power adjusts to the ideal driving position. So they do a terrific job of balancing out the Buicks comfortable image with extra bolstering for the Grand Nationals added performance. As a true high-end sports coupe, this comes loaded with all the best features. It includes a power windows, power locks, cruise control, power steering, tilt wheel, and the factory AM/FM/cassette stereo. And with the air conditioning blowing cold with upgraded R134a, you get to stay cool in this hot Buick. What really makes this one so special is whats under the hood. The 3.8-liter fuel-injected V6 turbo motor turned this Buick into a Corvette contender. And because the powerplant is so essential, this one has an exceptionally tidy look thats ready to show off. Its even believe to be the original motor to the car. Plus, features like front disc brakes, sway bars front & rear, and a limited slip rear end make sure this handles like a proper turbocharged sports machine should. But remember, the four-speed automatic transmission is not only there for quick shifting action but also for overdrive comfort. So youll get just as much pleasure out of this one chewing up the asphalt as you will cruising under the midnight neon. Complete with window sticker and owners manual, youre looking at one of the most desirable machines from the 1980s. And you know this is an irresistible price for a complete and loaded coupe like this. So dont delay, call today!